Info "This clock doesn’t have the right time. Turn the hands to fix it." Not to be confused with Clock Watchers. Clock-Watcher is one of Orbulon's Microgames in WarioWare: Smooth Moves. 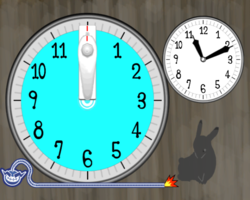 With the Nunchuk as the hour hand and the Wii Remote as the minute hand, the player must adjust the clock to match the time indicated on-screen. 1st level difficulty: Slight adjustment. 2nd level difficulty: More adjustment. 3rd level difficulty: Indicated time is in digital reading. This page was last edited on February 20, 2018, at 18:21.